Need a break from wedding planning? Looking for encouragement? Want to express the romance in your relationship, but don’t know exactly what to say? Welcome to our list of inspirational love quotes. Get lost in heartfelt and honest reflections of what love is truly supposed to be… courtesy of writers, poets, counselors, artists, and philosophers from all over the world. What is love, to you? Share your thoughts and favorite quotes! 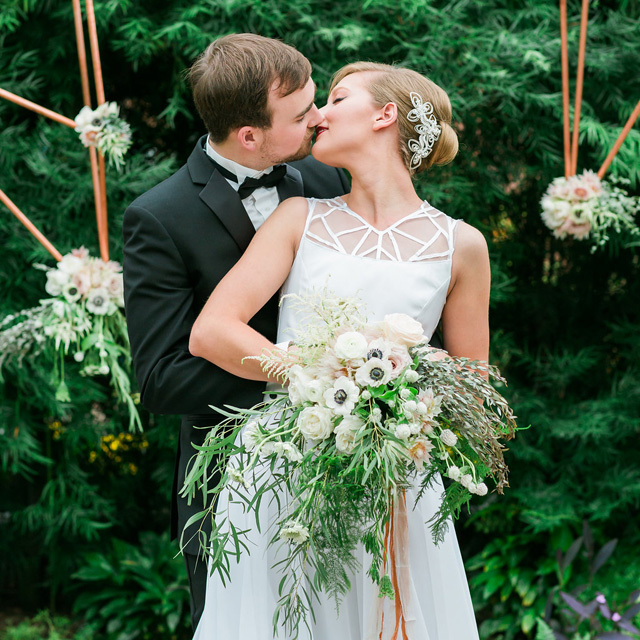 Planning a laid-back bohemian style wedding? Congratulations! You are officially a low-key, cool bride. For boho-chic, glamping, or rustic wedding themes, your styling options abound. 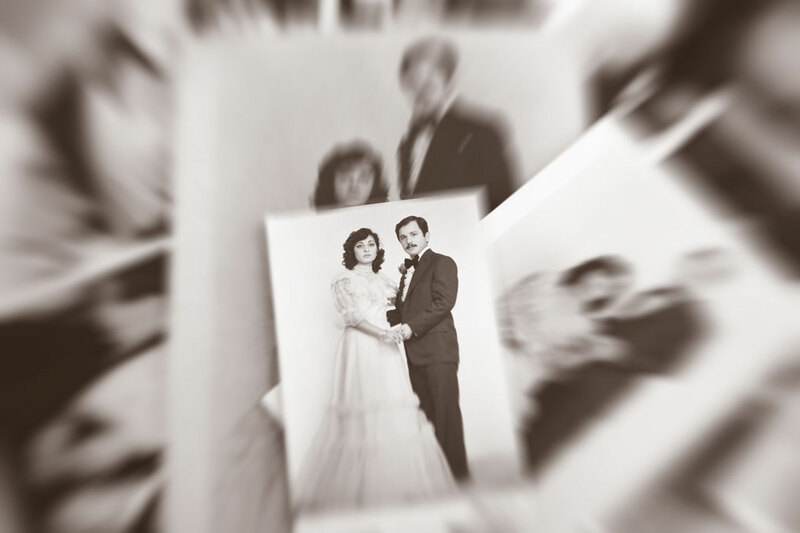 No longer are brides limited to strapless ball gowns and high heels. In fact, once you’ve chosen a comfortable dress you love (that’s right, we said comfortable), all you have to do is add a few special accessories, and presto! You’ll look and feel like a bride—without boning, pins, body tape, or corsets. 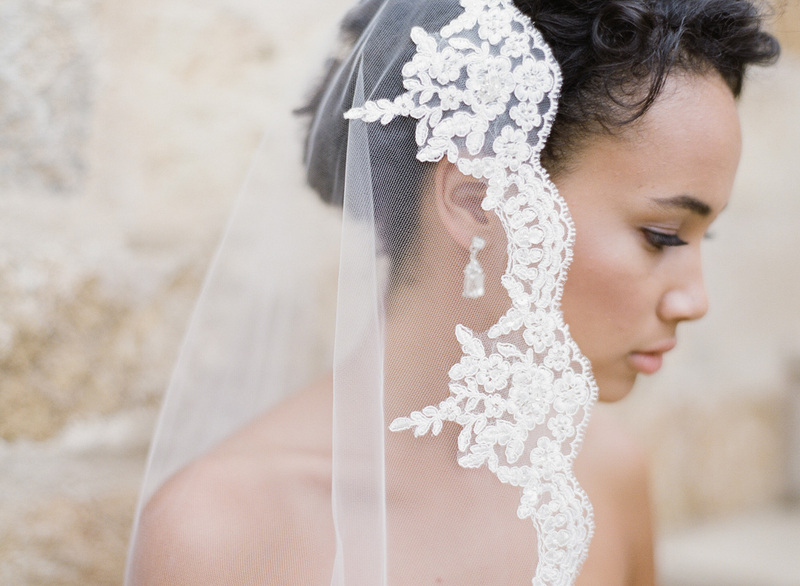 Since we’re an accessories company, we’ve got the inside scoop on the prettiest headpieces and veils for your style of wedding. Scroll to check out our top 6 picks just for you. Sheer beauty floats atop your head with this light-as-air veil. Six different tulle petals create a graceful, ethereal design that is bridal yet so boho-chic. There are no trims or fussy frills included. You can order this style with the same color petals or with a blend of shades for your own unique look. 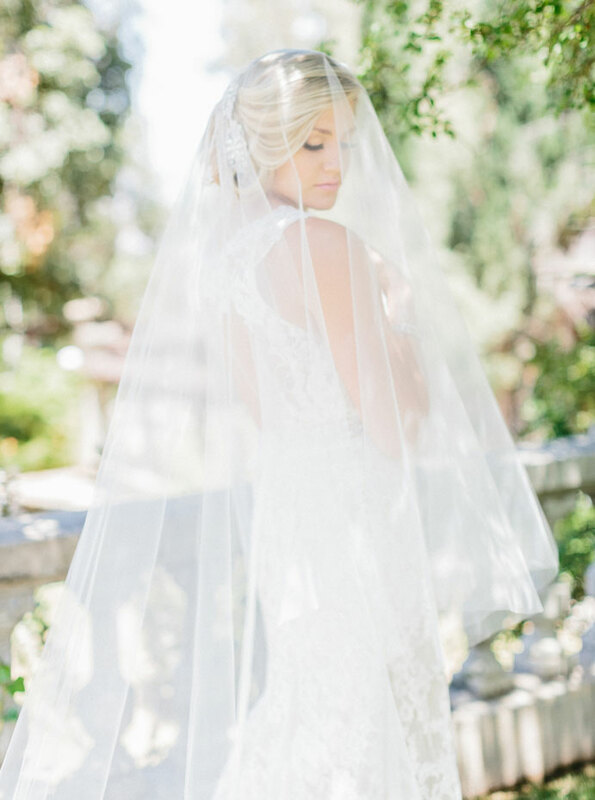 For a look that is blissfully simple, a cascading ribbon edge veil will do the trick. This design features rounded corners and a waterfall of tulle that floats down to fingertip length. Especially if you’re hosting a wedding weekend with multiple events, this style is perfect to throw on for the actual ceremony. Want that picture with a beautiful long veil blowing in the breeze? 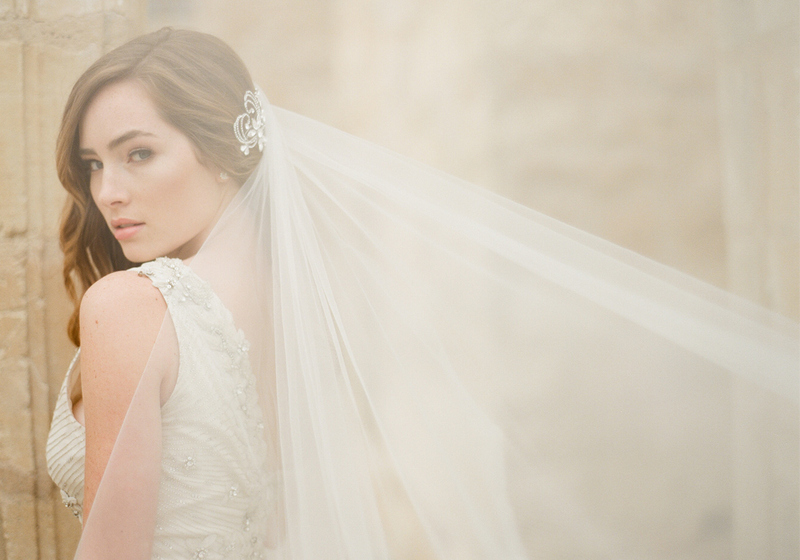 If you love the dreamy appeal of a bridal veil, this cathedral is perfect. A sheer foldover design floats behind you in a cloud of tulle. You can wear the top tier over your face or behind you—both looks are incredibly romantic. Weave an enchanting spell with a gorgeous, glittering hair vine. This lovely, flexible design features shimmering opal crystals or rhinestones and can be worn as a headband or woven into your hair. Perfect for styling a creative boho-chic look with a smidge of sparkle, this vine secures on organza ties. Make your day feel truly special by gilding your locks with a metallic leaf headband. Glittering with rhinestone accents, this antiqued metal headpiece brings an elegant aesthetic to your bohemian look. This design coordinates beautifully with an enchanted forest or glamping theme. Bring on the flower power! Grace your hairstyle with a beautiful tie headband of soft organza flowers and rose buds. Embellished with subtle lace details and sparkling rhinestone accents, this ethereal design touches your tresses with bridal romance. The semi-flexible band ties on sheer organza. Want more ideas? 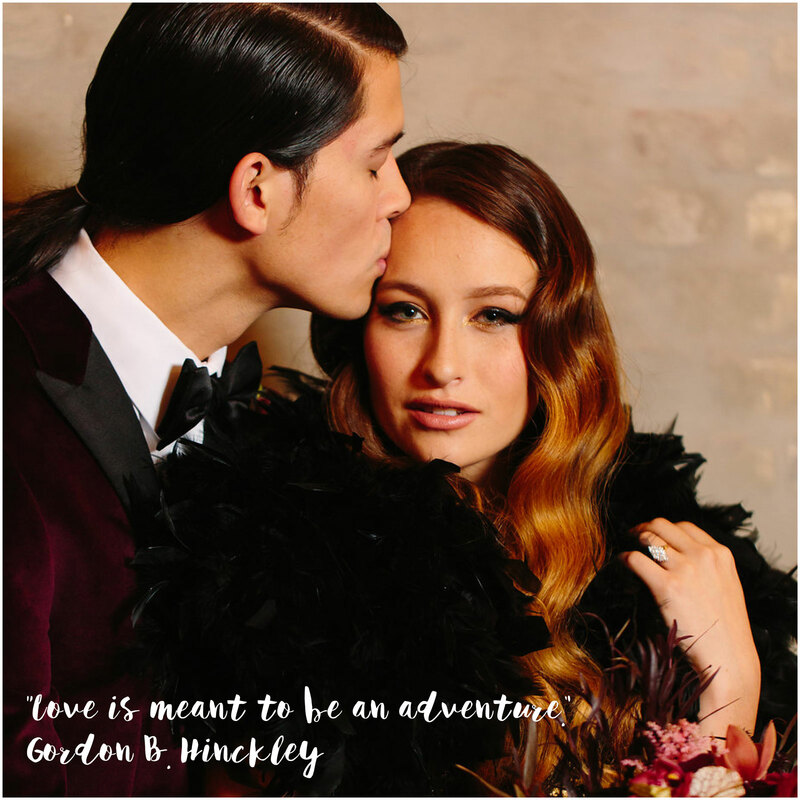 Check out our My Bridal Style: Bohemian page for inspiration. You can also follow us on Instagram for pretty styled shoots and real bride features. We absolutely love this amazing video published by Glamour! Showcasing the lovely engagement rings and popular bridal looks of the past 100 years, this stylish shoot features all kinds of pretty. Which decade is your favorite? We adored them all, so here’s the scoop on how to style your very own vintage-inspired look! At the turn of the century, modest Edwardian gowns and simple rings were in vogue. Think parasols, bustiers, stockings—the whole nine yards! Veils during this era were long and simple, often accompanied by flowered hats or floral garlands. 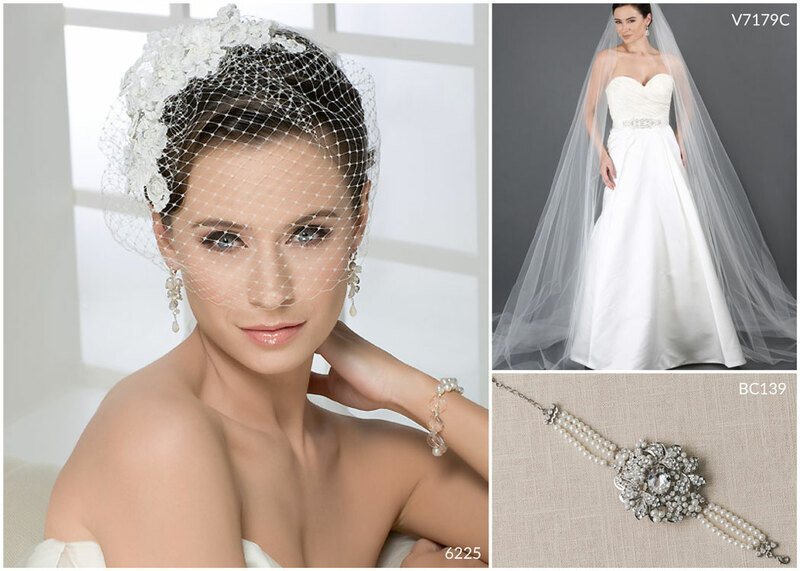 Our Top Picks: Style this look with a vintage gown à la Downton Abbey and classic accessories like headpiece 6410, veil V7198, and bracelet BC141. This decade was all about opulence and fashion-forward sparkle. 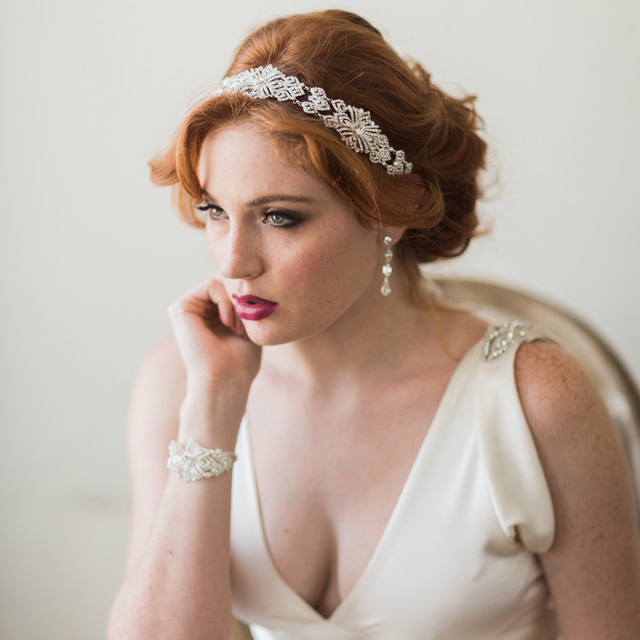 Thanks to the Gatsby movie a few years back, modern brides inspired by this jazzy era have plenty of options! Geometric designs, beautiful beading, and Art Deco lines create a fabulous ‘20s theme. Our Top Picks: Style this look with a jazzy, beaded sheath gown and sparkly accessories. Try on headpiece 6351, a clip like 6405, and a tie veil such as 6354. 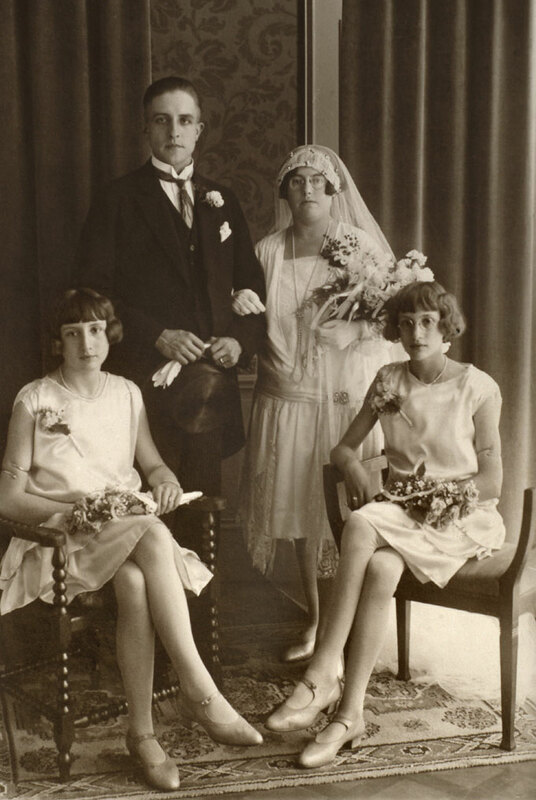 Due to the economic crash of the Great Depression, this era featured much more modest wedding attire. Suit sets and blazers came into style, though intricately beaded cap veils were still popular. Our Top Picks: Petite bow clip 6607, Chantilly lace cap 6364, and bracelet BC130. 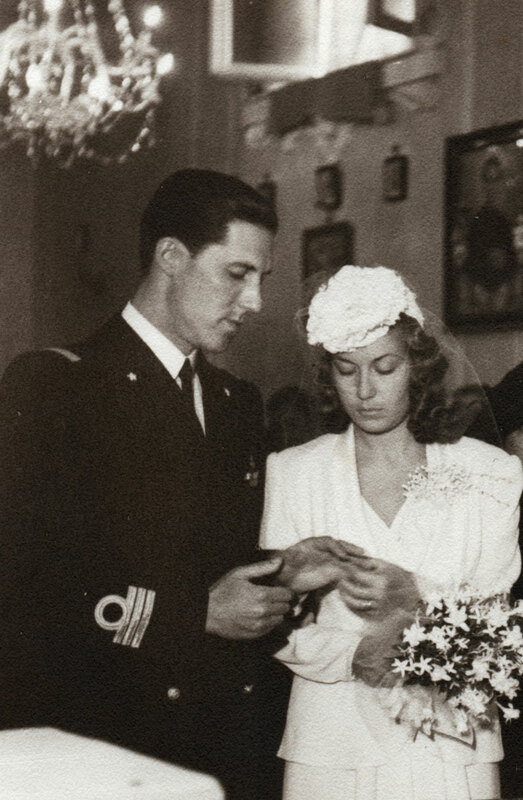 Much like the previous decade, dress suit sets were popular and often worn by military brides. 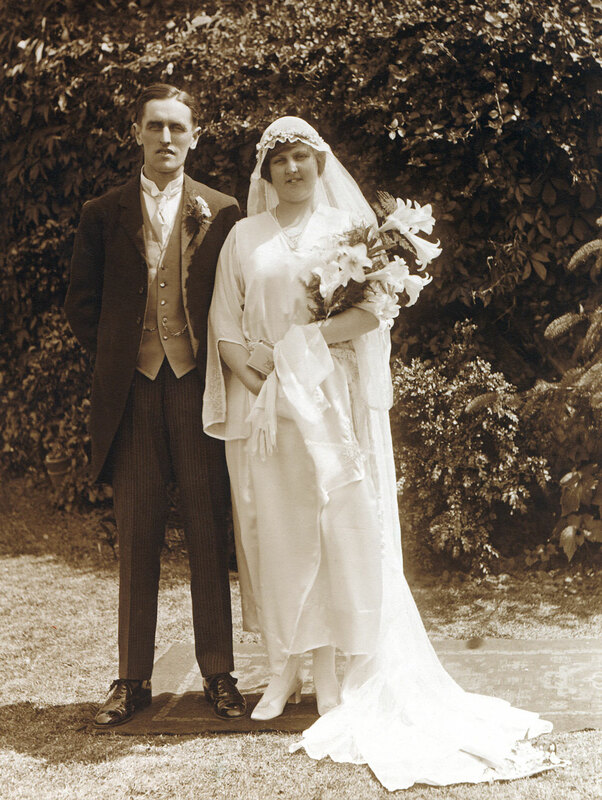 Modest, high-necked wedding dresses and long veils were in style. 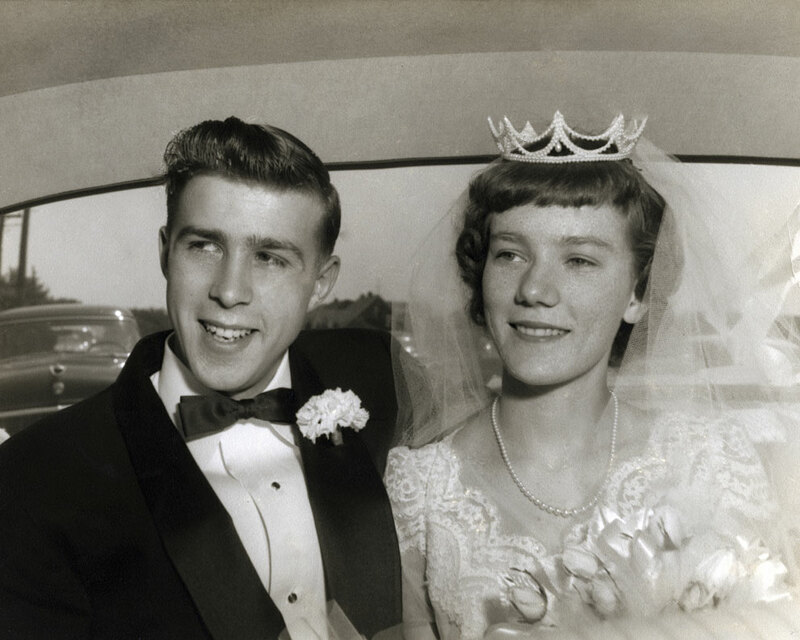 Flower headpieces, pearls, and lace gowns grew in popularity. 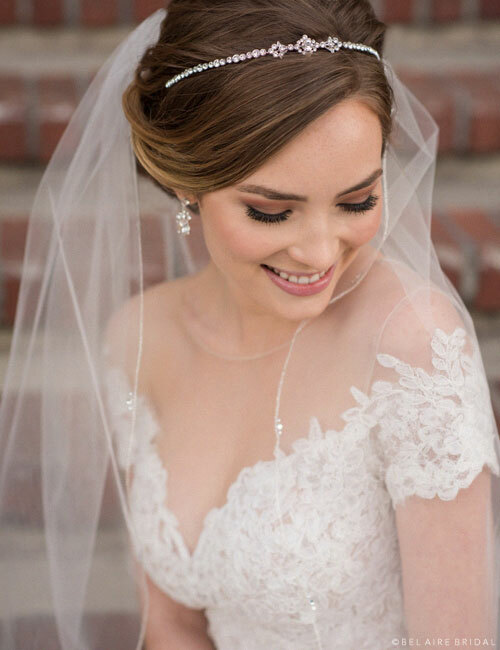 Our Top Pics: Style a look of endearing romance with pearl crown headpiece 6491, tie lace veil 6444, and pearl jewelry set J2094. 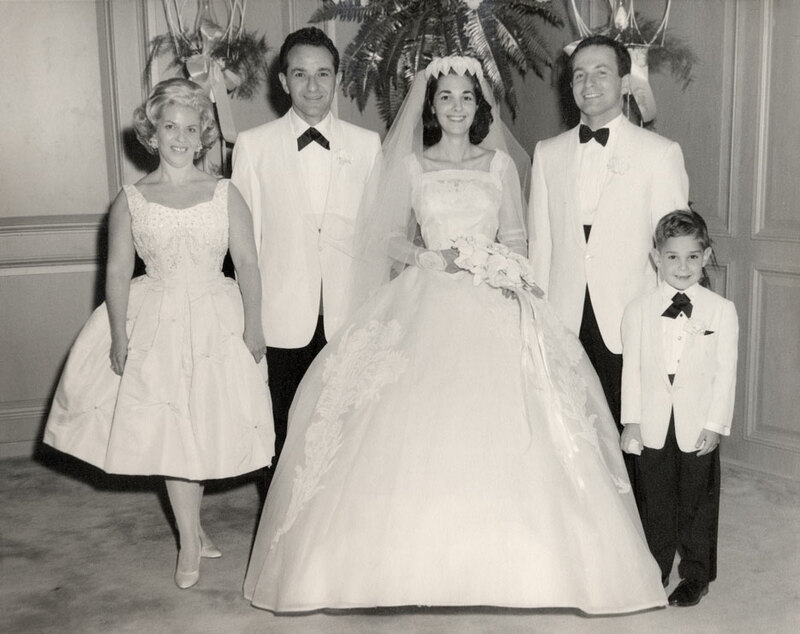 The economic upswing of the ‘50s meant more extravagant wedding attire! Stand-out examples include Jacqueline Kennedy’s beautiful off-the-shoulder bridal gown and decadent cap veil, as well as Grace Kelly’s high neck lace gown and lace trimmed veil. 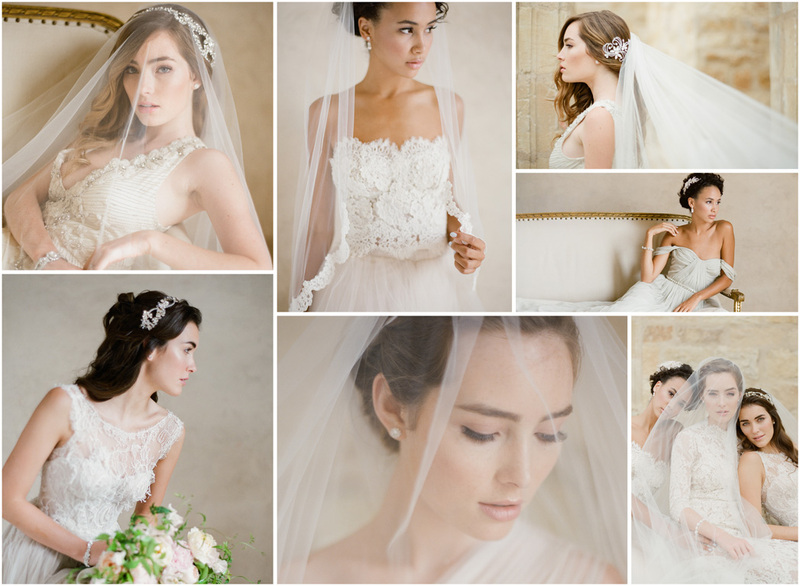 Our Top Picks: Style this look with a period-inspired French net veil like 6225 or a dramatic cathedral veil like V7179C. Add pearl-encrusted bracelet BC139. Diverse fashions in the ‘60s offered brides everything from long lace sleeves to full-skirted princess gowns to modest going-away suits. Some brides wore hats, some wore flowers, and some went with multi-tiered veils. 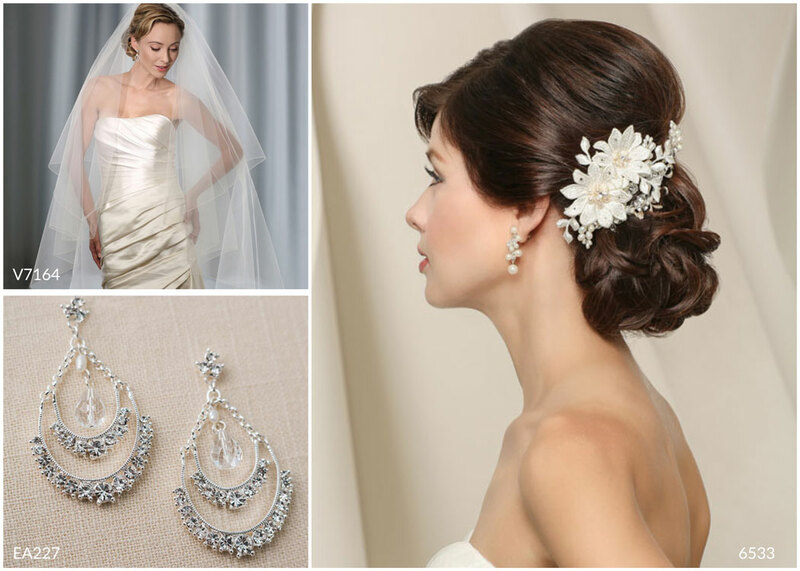 Our Top Picks: A dreamy veil with lots of volume like V7164, Venise lace flower clip 6533, or drop earrings EA227. Spread the love! Bohemian looks were all the rage (and are still loved by the modern boho-chic bride). 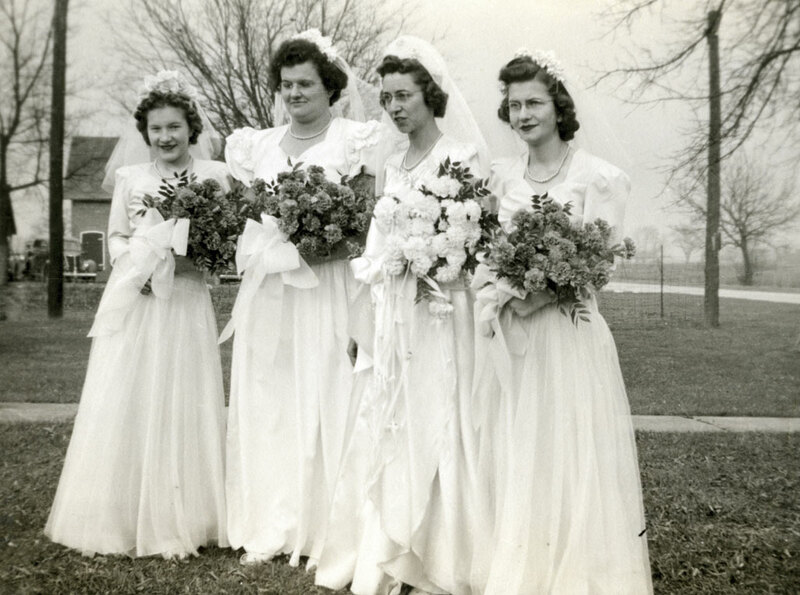 Floral lace veils, unstructured dresses with lots of layers, and flower headbands were popular. Our Top Picks: Stick a pretty flower on lace headwrap 6378, wear a lovely lace-trimmed veil like V7322, or try on a sparkling vine headband like 6647. The poufy sleeves, crazy colors, and big volume of the 1980s left a lasting impression. Over-the-top veils and voluminous gowns with long trains became popular after Princess Diana’s 1981 wedding. Opulent ceremonies with lots of lace and floral accents became the big thing. 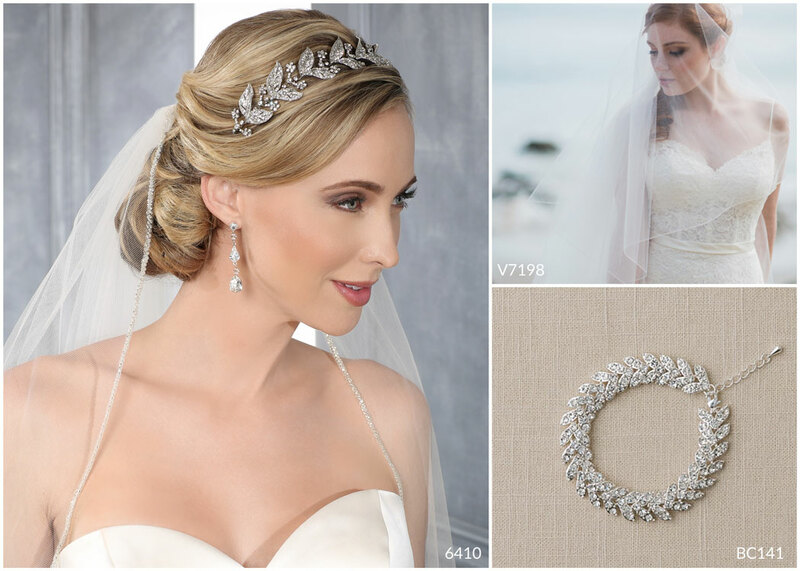 Our Top Picks: Re-create a retro look with an eye-catching headpiece like 6324, a dramatic cathedral veil like V7196C, and bling-worthy jewelry like BC102. Sleek and slim became popular in the ‘90s, with satin gowns, spaghetti straps, and simple silhouettes taking over. Crisp updos and minimal makeup were preferred to create an elegant, refined look. Brides began to incorporate colored sashes or ombré gowns. 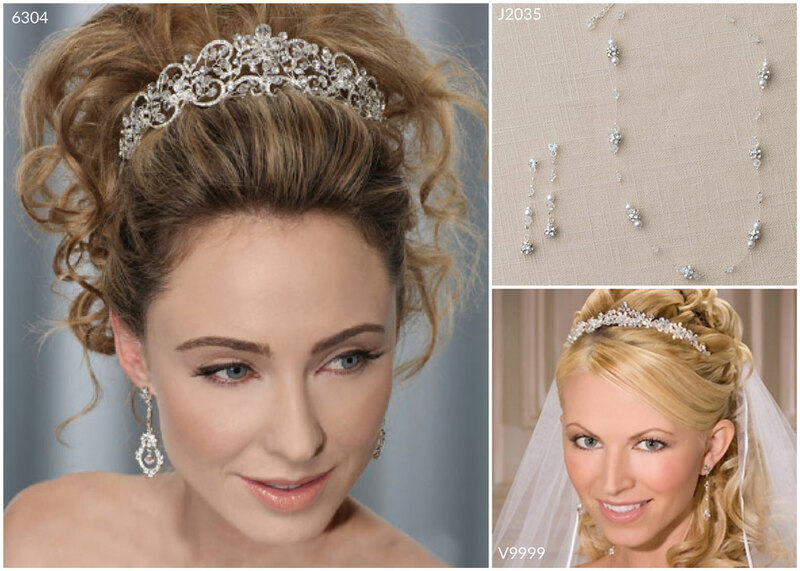 Our Top Picks: A princess tiara like 6304, a ribbon edge veil like V9999, and dainty jewelry set J2035. In the past decade, strapless princess-style dresses and dramatic skirts ruled the runways. Fit and flare lace gowns and destination wedding looks became popular. Fingertip veils grew in demand, while unique accessories personalized each bride’s ensemble. 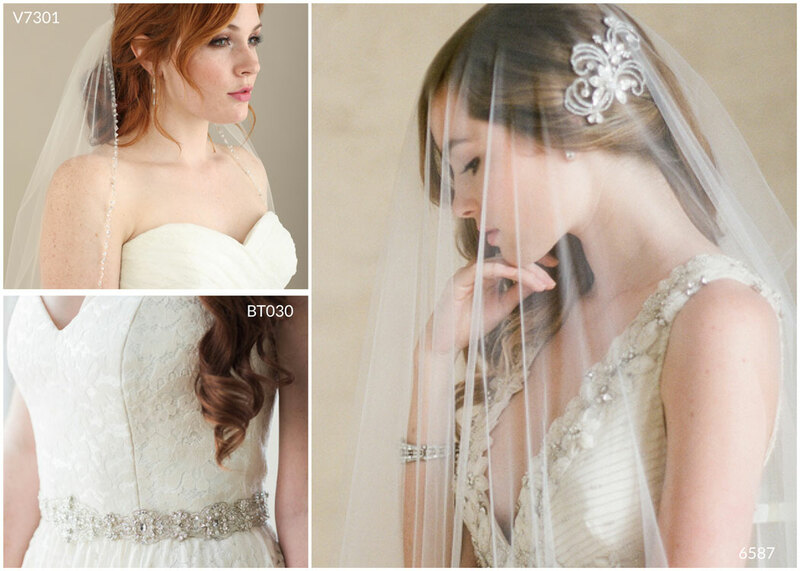 Our Top Picks: A beaded edge veil like V7301, sparkly headpiece like 6587, and a beautifully embellished belt like BT030. Welcome to The Pinterest Bride era! Today, customization is everything. Lace sleeves, creatively embellished backs, and whimsical layers offer brides plenty of options. Designers offer gowns in a range of colors. Beaded patterns, removable overskirts, dress separates, and new laces have taken center stage. Cathedral veils are back. Our Top Picks: A dreamy foldover cathedral veil like V7234, nature-inspired headpiece like 6605, and shoulder jewelry like SH209. What do you think the next decade will bring? A return to the sleek and sparkly styles of the 1920s, a throwback to retro designs from the ‘70s or ‘80s, or something entirely new? Want to see more lovely vintage-inspired looks? Browse our My Bridal Style: Vintage board for ideas! Our shoulder jewelry is finally here! From vintage stylings to modern designs, our twinkly and glamorous accessories dress up your strapless gown and make it unique to you. 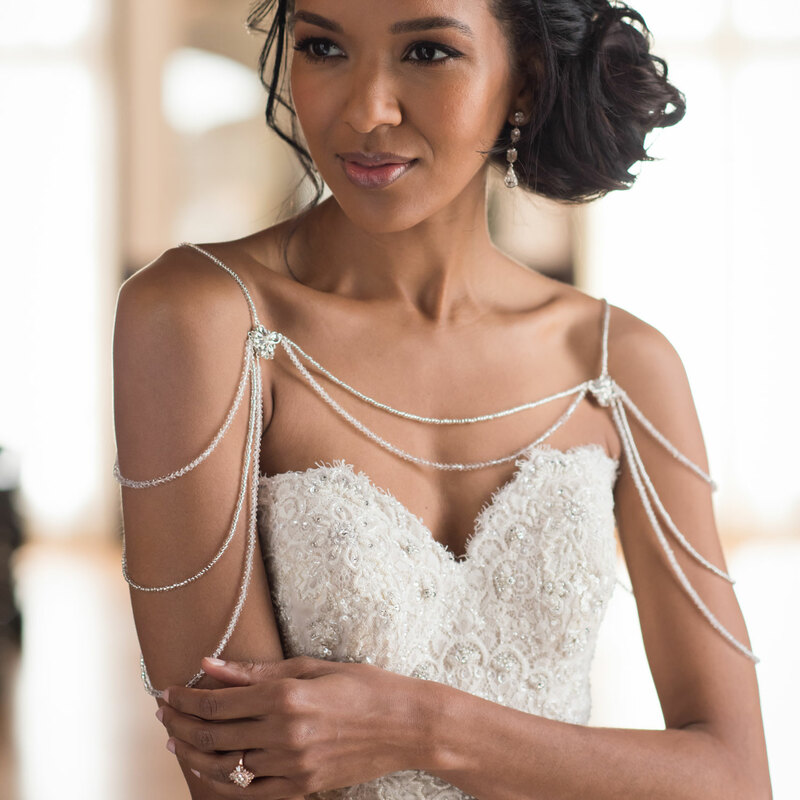 Whether you’re matching a beaded vintage gown, giving a plain dress more bling, or adding sparkle in place of a necklace, these lovely shoulder jewelry styles add stand-out beauty to your bridal look. Remember to use #shouldershimmer for a #BelAireBridal repost! Ready to sparkle? Style SH206 adds a dose of pure glamour. 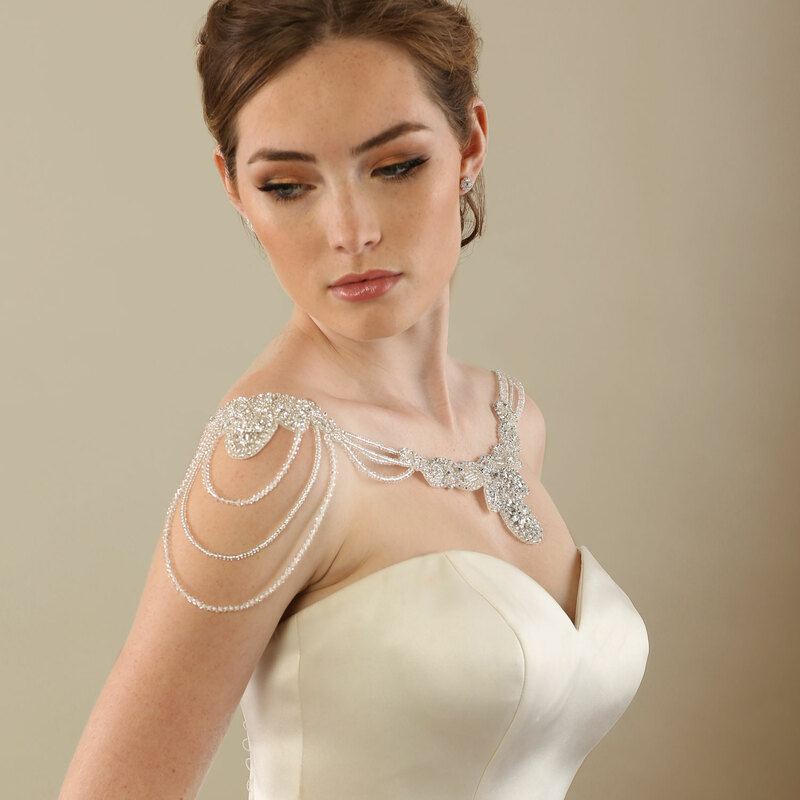 Delicate double strands grace the front and back of your neckline, while triple rows of bling decorate your arms. A dazzling alternative to a wrap or bolero, this daring design lets you shine. Get your vintage style on wearing design SH207. 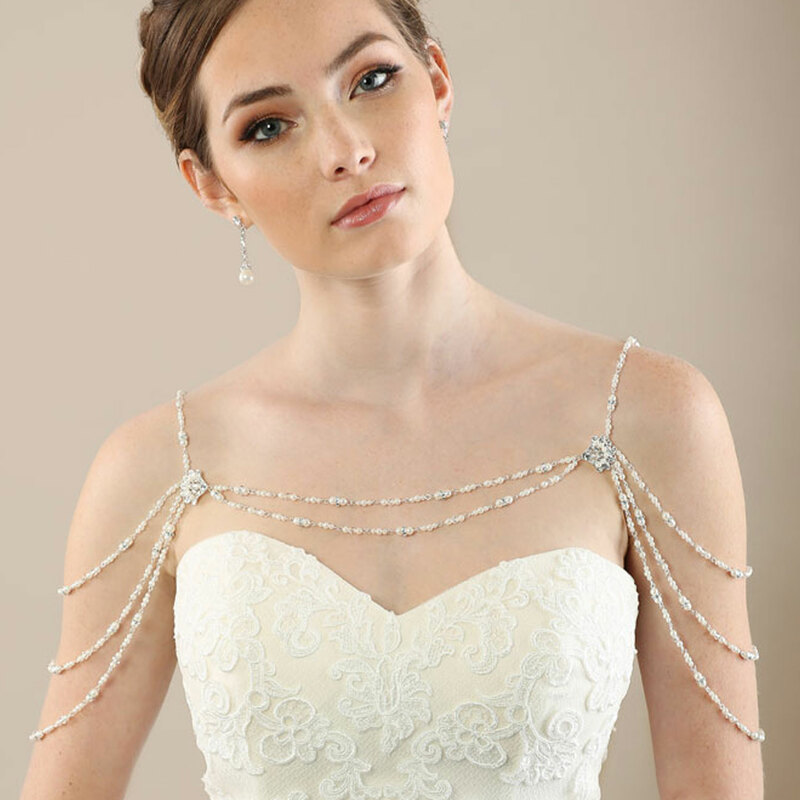 Packed with pretty pearl strands culminating in intricately beaded appliqués at the front, shoulders, and back, this charmingly old-fashioned design complements a graceful ensemble. Match it with pearl earrings to complete the look. Catch the light with dazzling allure wearing style SH208. Shimmering rows of clear crystals and decadently beaded appliqués studded with tiny silver beads enriches your bridal ensemble with lavish beauty. Style this gorgeous design with stud or drop earrings to complete the look. Incorporate gorgeous sparkle and stunning silver shine with style SH209. Rows of dazzling clear crystals and silver beads combine in a breathtaking design of double draped strands in the front and back, with triple strands dangling down over your shoulders. Beautifully complement a beaded or plain gown with this luxurious design. Top off your vintage gown with style-savvy SH210. Composed of beautiful strands of pearls and sparkling rhinestones, this timeless design incorporates the elegance of decades past with a dramatic new twist. Add other pearl accessories for a radiant bridal look. Are you going strapless for the big day? Be sure to follow us on Instagram for ideas to style your reception look and more! Share your pics with #BelAireBridal for a repost. Getting married in a hurry? That’s wonderful! 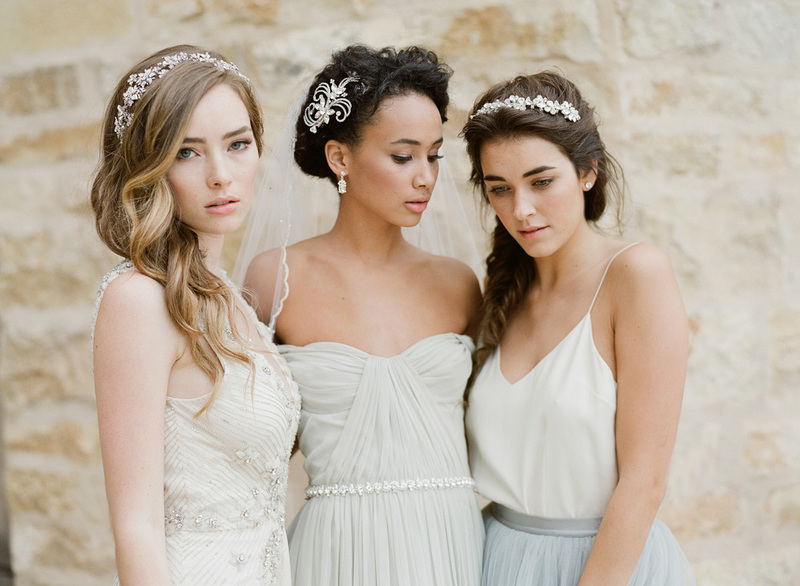 Check out these easy-wear headpieces and add fun wedding-day charm to your look. Go back in time with style 6607. This cute little rhinestone bow jazzes up your hairstyle with the perfect dash of vintage sparkle. Graceful clip 6646 combines classic pearls and twinkling rhinestones in a gorgeous floral design. Wear it on the side or in the back for a traditional bridal look. Style a cluster of gold or silver flowers into a romantic hairstyle with comb 6636. 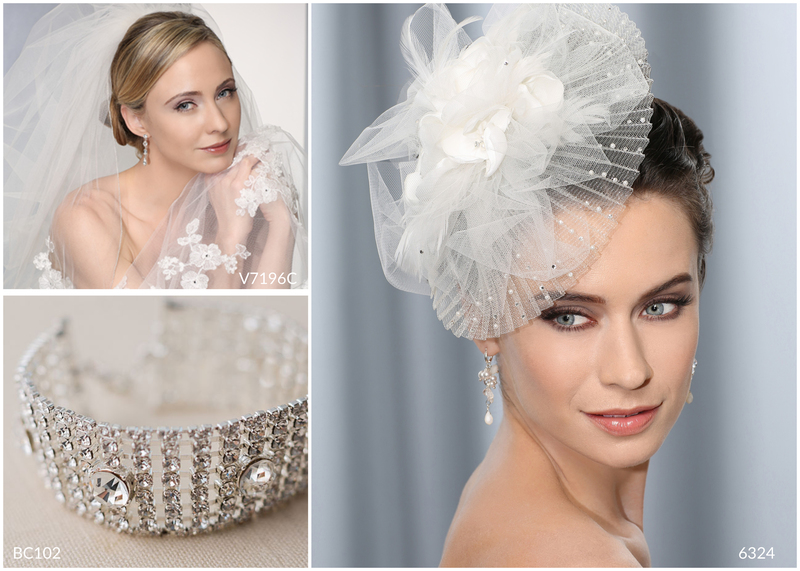 Shimmering crystals add special radiance to an elegant wedding day look. 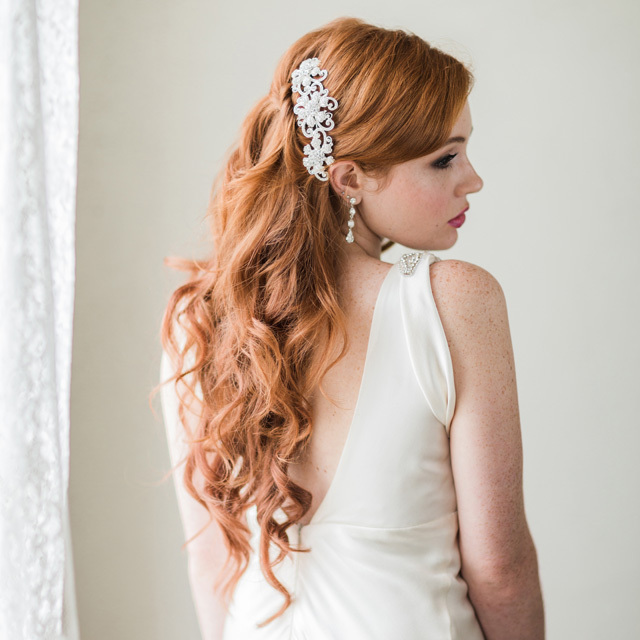 Going away to say “I do?” You’ll love wired opal crystal hair pins 1717. Tuck them into your updo for a last-minute bit of pretty that will look good everywhere you go. Create a fabulous look just for your special day. Style 6617 blings up your hair with rhinestones and opal crystals. Wear it with a bun or half-up hairstyle, your choice. Adorn your beachy waves with style 6647. 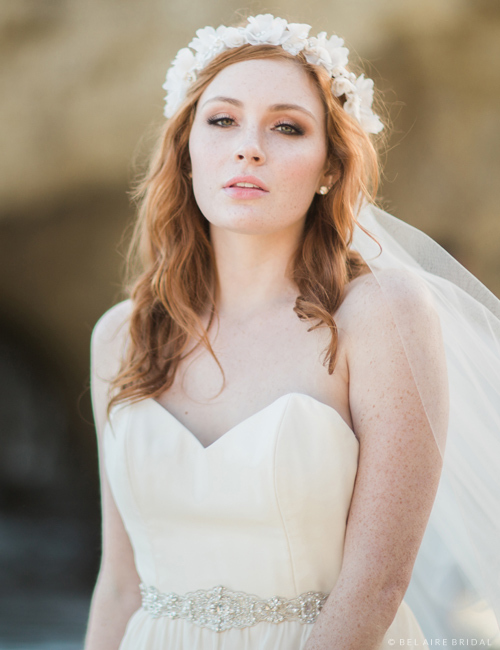 Soft flowers on a flexible hair vine offer a boho bridal look that is all you. Infuse your hair with a brilliant bit of sparkle! Style 6620 will make you feel like a princess, even if it’s just for a few hours. Tell us, which one is your favorite? 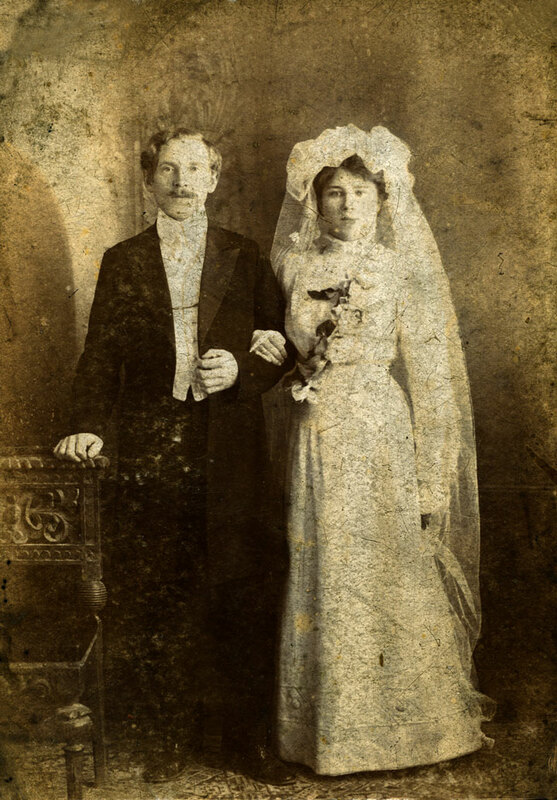 Seize the moment—why not wear a veil? 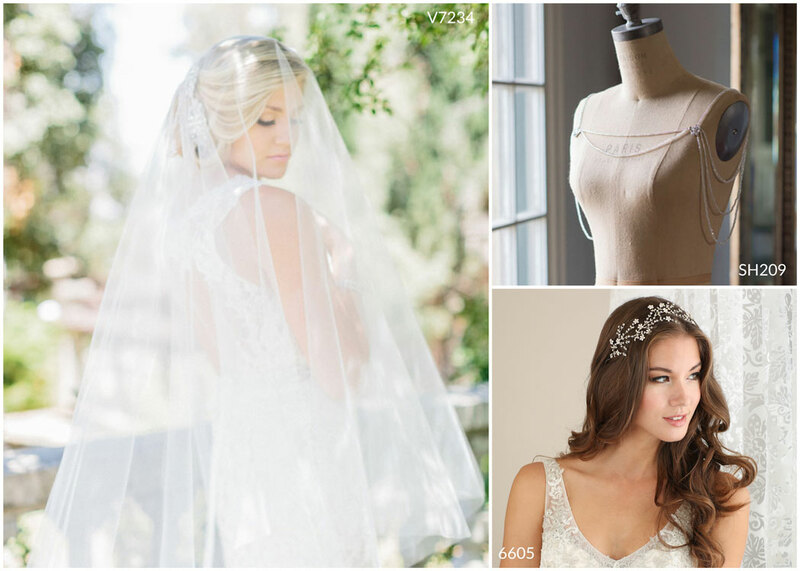 Check out our classic veils page for some fun, flirty styles you can throw on for your vows and toss away with the garter! Step into an age of fabulous glamour. 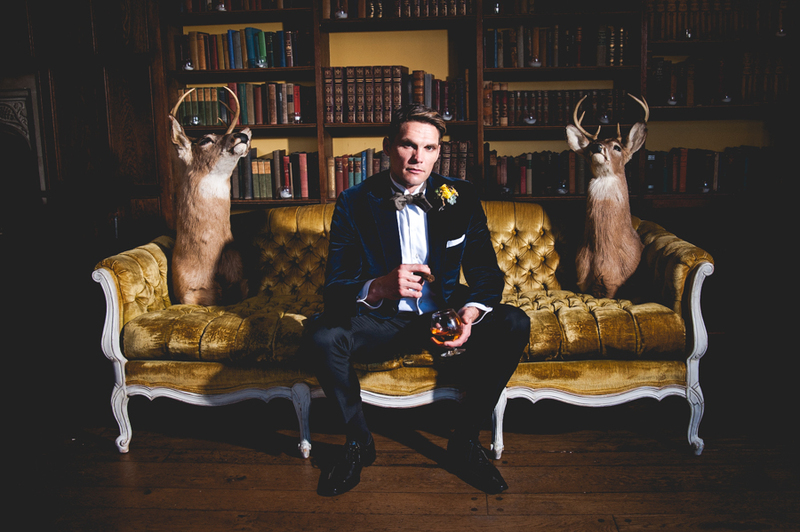 If you’re rocking a vintage style for your wedding, check out this classy photo shoot by Amanda Lauran Photography and Michele Wilderman Styling for inspiration! Beaded jazz-age dresses and snazzy gent’s attire create a theme of Art Deco opulence. Hair designs featuring fantastic bling lend sophisticated glamour to your look. Keep in mind that accessories define your style. Slip on a rhinestone halo like 6505 for a more boho-chic vibe. A glittering comb like 6503 or 6580 adds a classic accent that dovetails perfectly with a slinky satin sheath or vintage lace gown. 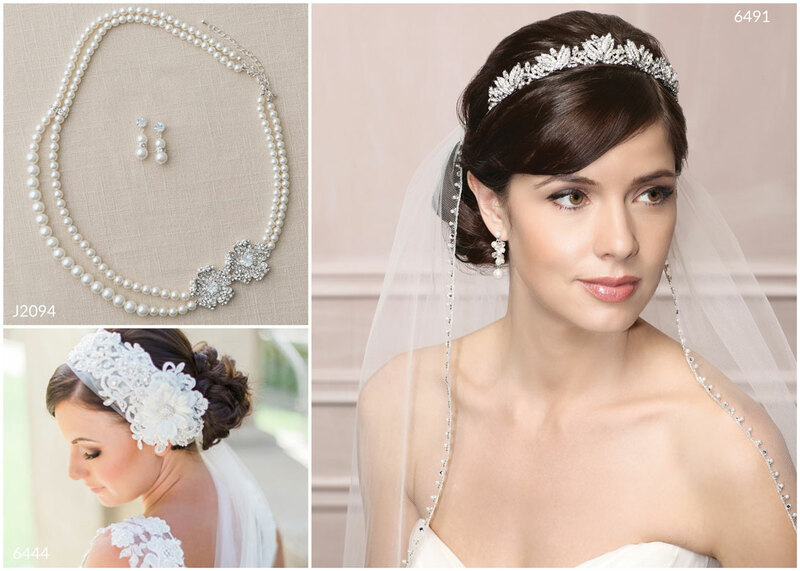 For a dramatic dose of sparkle, a headpiece like 6501 brings the opulence of the 1920s to your big day! This bride and groom incorporated navy blue and metallic grey with a small pop of sparkle and color to spice up their vintage theme. 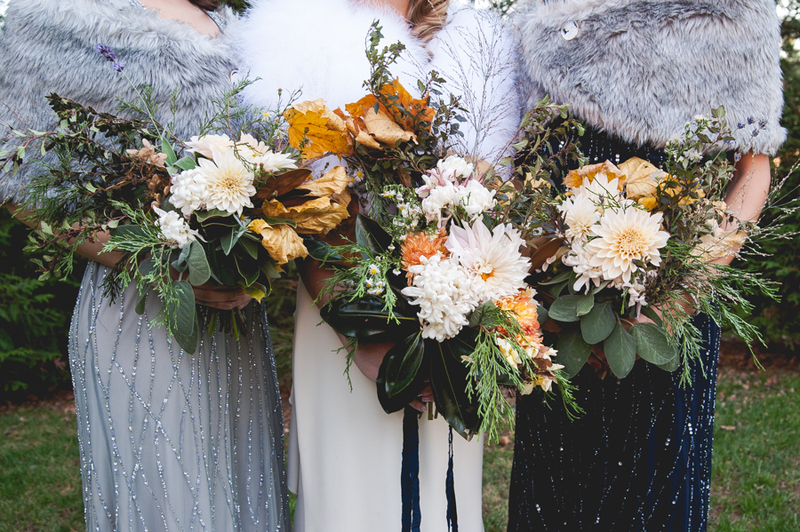 Dramatic makeup, artful bouquets, and winter shrugs suggest a seasonal wedding or New Year’s Eve party. Love the look? 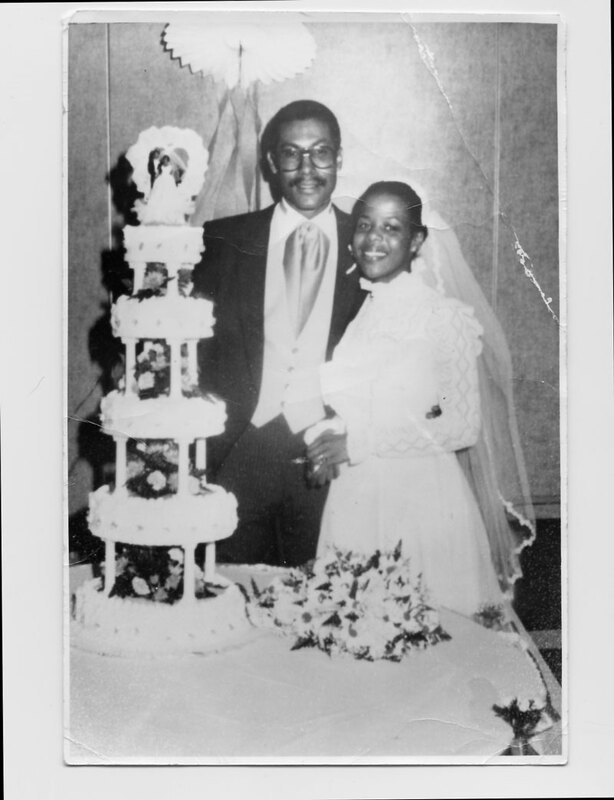 Check out our My Bridal Style Vintage page and Instagram feed for more elegant vintage wedding details. Want to get your husband-to-be involved in the wedding planning process? Show him a photo of a groom wearing a pink cummerbund and tie. That’ll get his attention quick. Most guys are willing or even eager to choose their own attire. 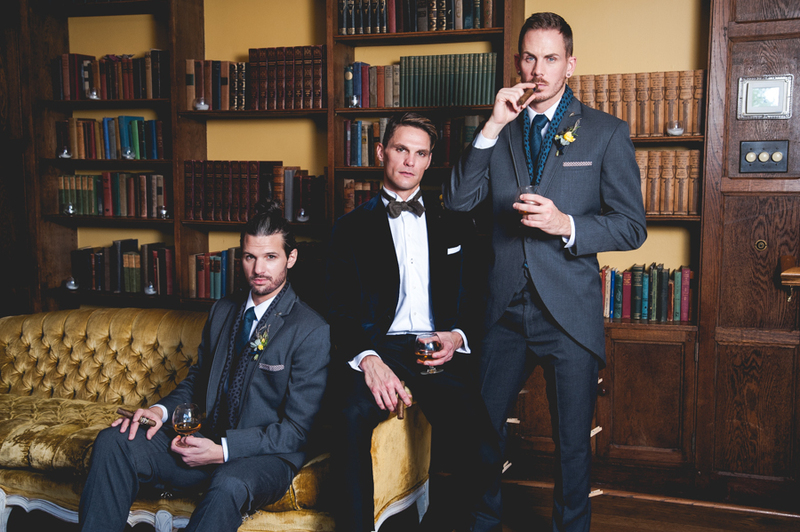 Check out our Style My Groom board on Pinterest for ideas that range from classic to retro, preppy to jazz age! If he doesn’t step up, you can absolutely feel free to pull out the pink for him and his groomsmen. 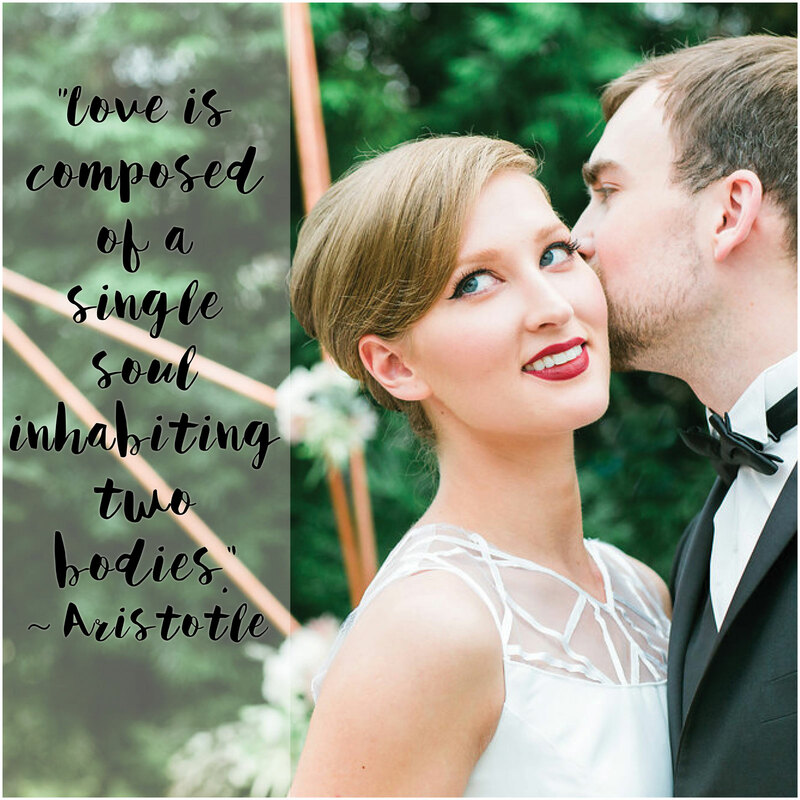 Coordinate your wedding style together. For example, if you have your heart set on a ball gown, a casual look for him might feel out of place. Similarly, if he likes the traditional look of a tux, you might reconsider going barefoot on the beach. Unless he wants to dance to your favorite tunes all night, he should help compile a song list! 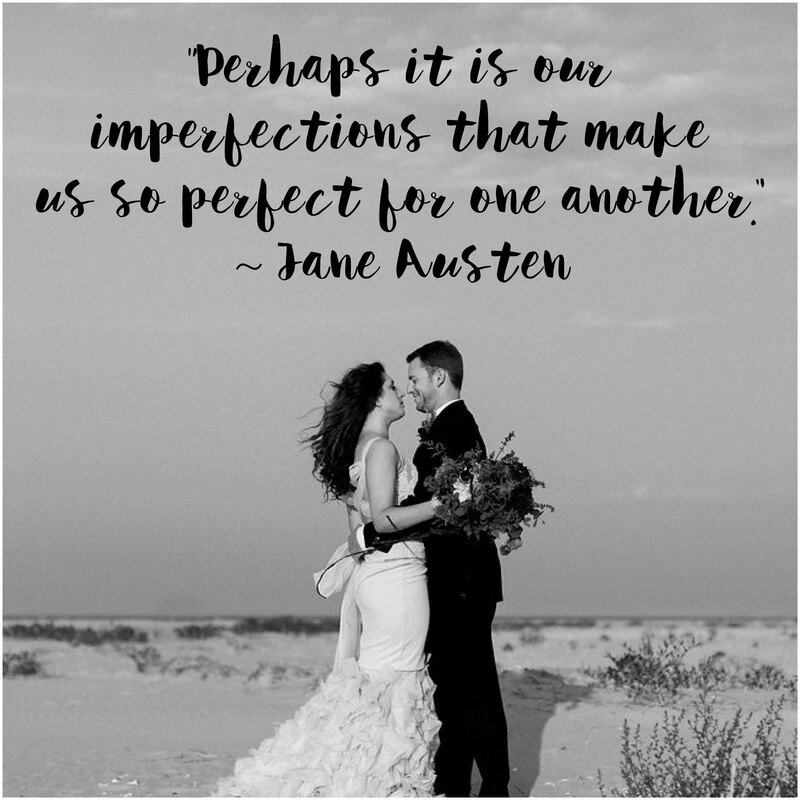 Many guys enjoy picking the DJ, choosing a signature groom’s drink, designing the wedding cake, or scheduling the getaway car. Play to each other’s strengths. The tech-savvy partner might be interested in trying a GoPro, scheduling a videographer, handling social media, or creating your wedding website. The artistic partner might enjoy designing your invitations, picking wedding colors, or making DIY decorations. Talk about which tasks you’re excited to do and which ones you’re dreading. Help each other out! 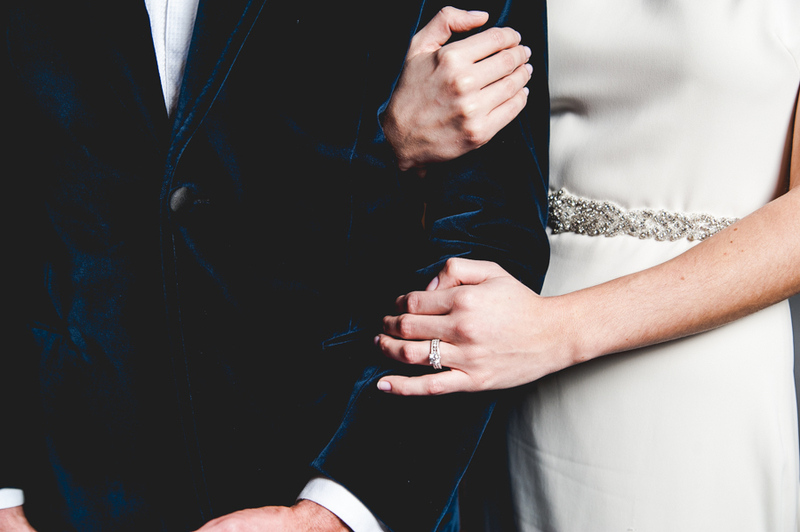 These days, there are no set masculine or feminine roles in wedding planning. For help choosing your season and/or theme, be sure to browse our other Pinterest boards for inspiration. Above all, have fun! This special day belongs to both of you. Posted on January 15, 2016 January 15, 2016 Author Bel Aire BridalCategories BA Love List, Bel Aire Bridal 2016, Belts, BHLDN, Bridal, Grooms, Industry Inspiration, Instagram Favorites, Photo Magic, Photo Shoot, Spring 2016, VintageTags Accessories, BALoveList, Bel Aire Blog, Bel Aire Bridal, Bouquet, Bridal Accessories, Details, Groom Style, Love, Romantic, Sparkle, styled shoot, Vintage, Vintage Wedding, Wedding, Wedding PlanningLeave a comment on It’s His Wedding, Too! Our Spring 2016 photo shoot was shot in Santa Barbara’s rustic Sunstone Winery to showcase our stunning new collection. 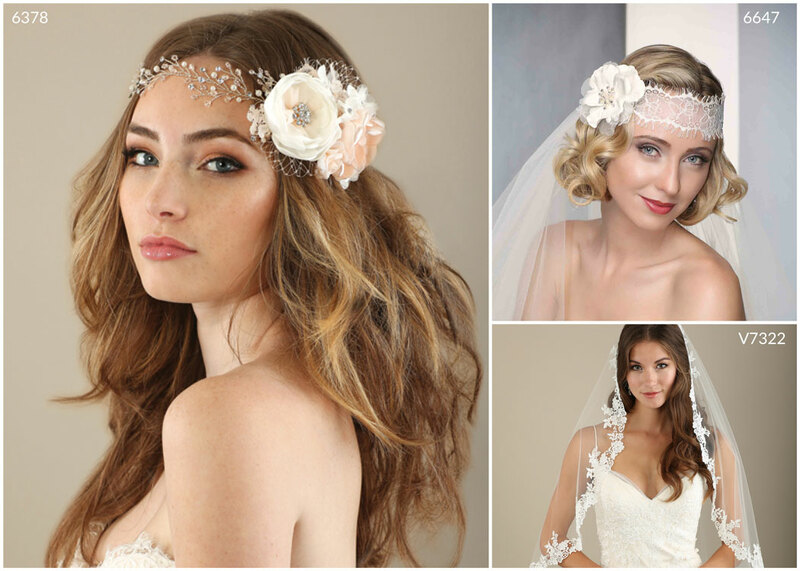 From pretty, soft floral headbands to graceful cathedral veils, these styles are perfect for the romantic bride. 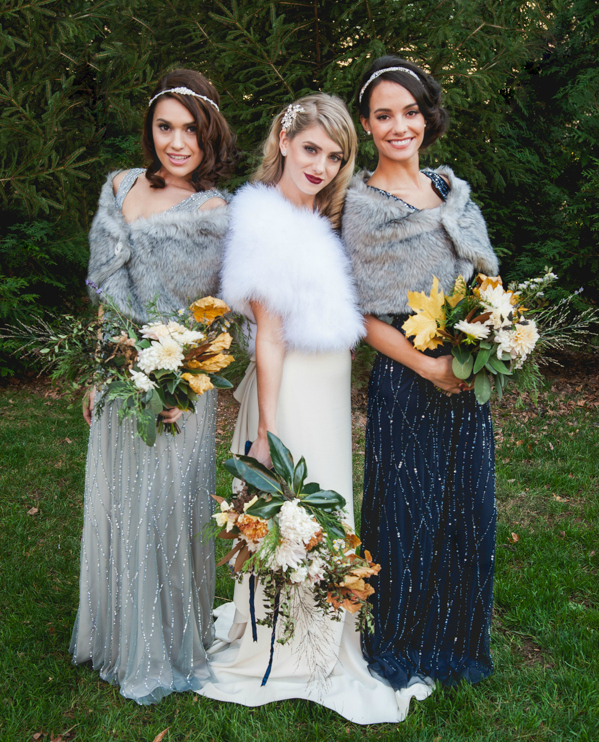 KT Merry Photography and Joy Proctor Styling captured the essence of feminine, ethereal beauty with our trio of gorgeous brides. Scroll down to view more! Gold metallic flower designs like 6588 and 6590 gracefully complete a vintage or romantic bridal style with a warm, luxurious luster. Soft floral headpieces such as 6551, 6320, and 6571 create a heartfelt aesthetic of budding romance perfect for any wedding. These lovely designs beautifully complement lace gowns. A touch of sparkle infuses any wardrobe with special charm and elegance. 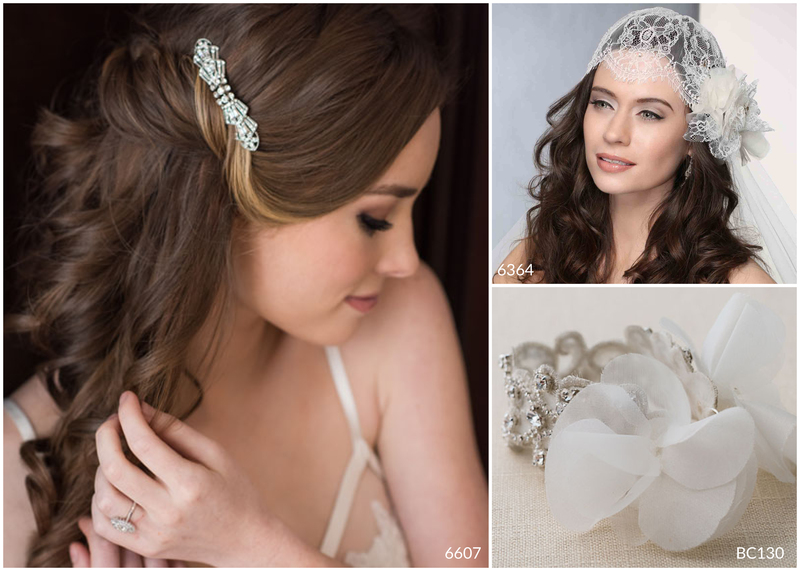 Designs 6465 and 6578 add a light dose of dazzling beauty to your bridal hairstyle. For ultimate romance, a cathedral veil is the only way to go. Style V7262C combines the ethereal grace of a cut edge veil with the feminine beauty of lace appliqués for a look that is totally stunning. Want to see more? Visit our Spring 2016 Collection for a full gallery of our newest styles. 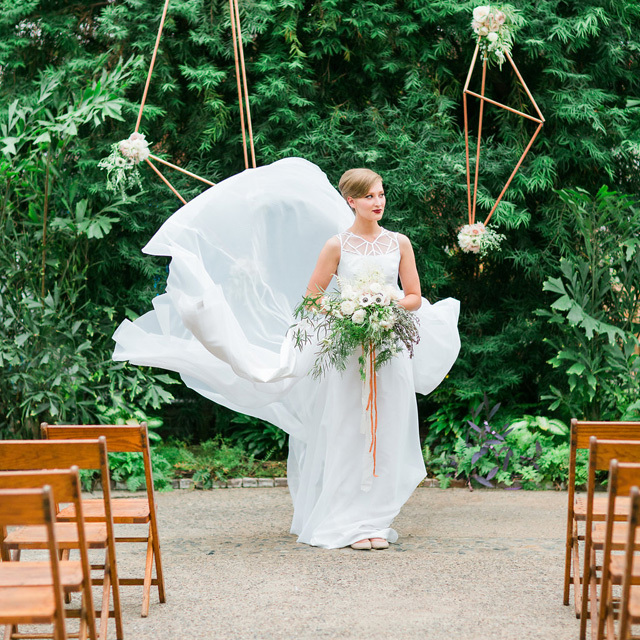 Looking for out-of-the-box wedding ideas? 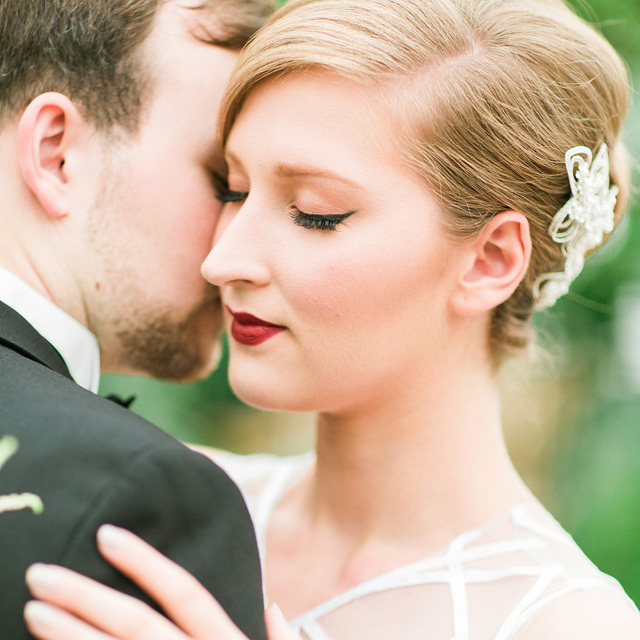 Check out this gorgeous styled shoot by Jessica Cooper Photography with the loveliest Sweet Caroline wedding dress! Staged in a lush, outdoor environment with both vintage and modern headpieces, this creative shoot reminds us of the beauty in expressing your individual taste. 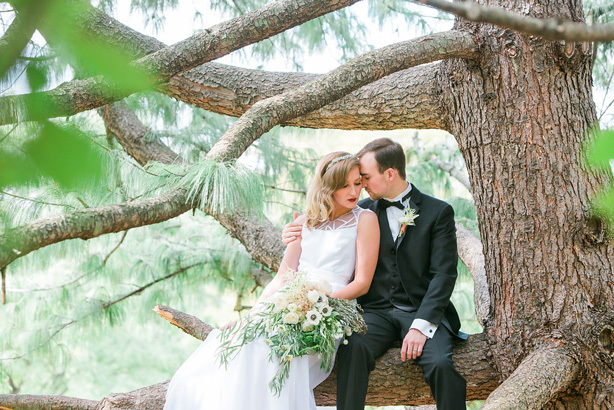 This black and white, classy wedding beautifully contrasts a vibrant, green venue. Complementing the rustic-chic theme are geometric flower arrangements and our very own floral headpiece 6542. The whole look is sleek, up-to-date, and streamlined—right down to a cake featuring hexagons and a matching wedding topper! The groom’s classic black tux vibes perfectly with the bride’s charming windowpane dress, creating a unique yet elegant coupling. 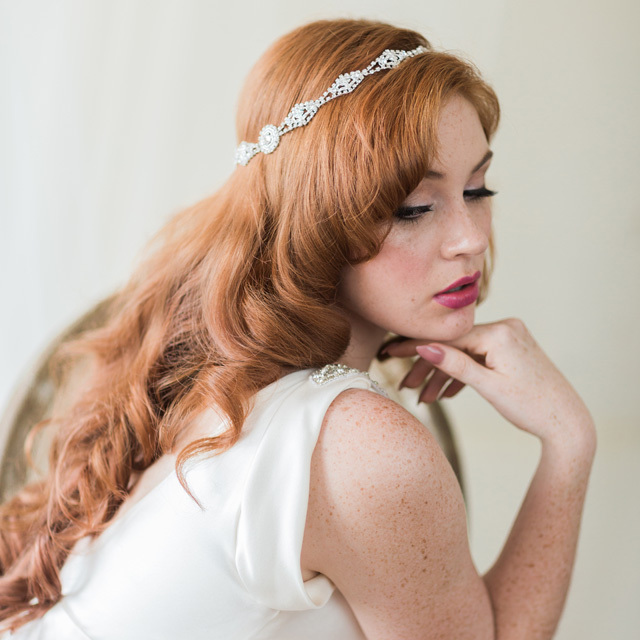 We love how she switched to pearl headband 6539 with vintage curls for a new look. Notice how the bride’s passionate red lip adds a bold touch of romance? A dramatic bouquet incorporates white and black anemones with lush greenery—how perfect for the holidays! Tell us, how are you styling your wedding? She dances to the beat of her own drum. Her attire is classic and timeless with a historic twist. Her smile is unforgettable; her sparkle lights up the room. Red lips? Absolutely. Bold bling? You betcha. 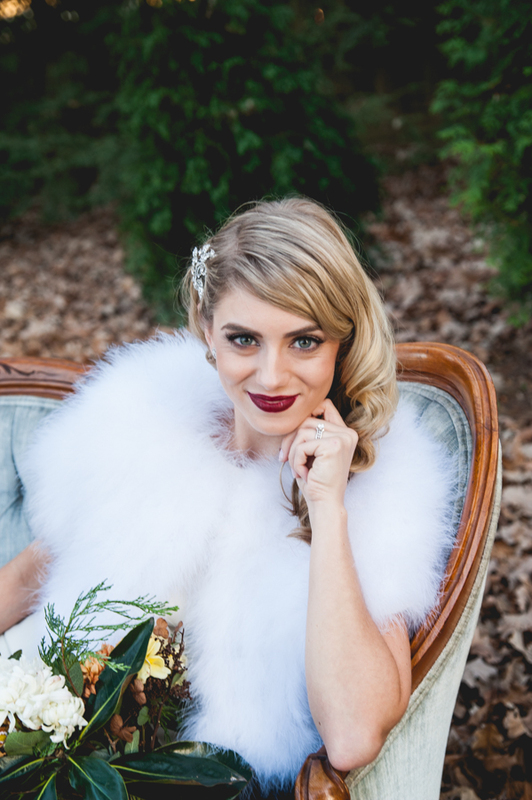 Are you a stylish vintage bride? Accessories can make or break your ensemble. This week, we’re pulling out all the stops and styling our most fabulous designs for all you vintage-inspired gals. Whether you love old-fashioned elegance or eye-catching bling, these decadent designs will bring bold beauty to your wedding look. 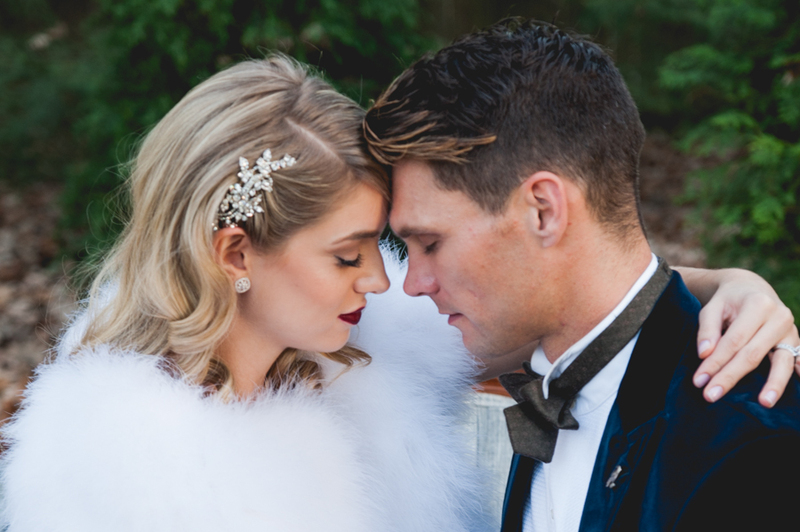 Enthrall your groom with a fascinator fit for Old Hollywood parties! Style 6280 combines rhinestones of all shapes and sizes in a fantastic headpiece practically dripping with opulence. A metallic cuff bracelet like BC132 combines baguette and pear rhinestones in a dazzling array for that added touch of magic. Style 6400 celebrates the age of jazz with edgy Art Deco patterns and serious sparkle. Get ready to wow your guests wearing this twinkly, silver statement piece! Match it with bracelet BC145 or some stunning drop earrings for extra pizazz. Speaking of enchanting, style 6161 makes it easy to lock eyes across the room. Glamorous rhinestones and intricate silver beads weave an instant statement of fashion and style. Pair it with a simple but slinky satin dress, and you’ve got an alluring combination sure to take your partner’s breath away. Bonus: this design may be worn as a headpiece or a belt. Which would you choose? Maybe your style is a bit more classic. Add a timeless heirloom to your bridal wardrobe with style 6193—an exquisite comb of metallic flowers sparkling with fantastic elegance. Wear it with a veil or alone as a twinkling accent piece. Say hello to retro! For the trendy bride blending something old with something new, boho-chic halos bring carefree bling to those loose, wavy locks. These versatile styles are perfect for a dress change and look amazing with or without a bridal veil. Turn heads with the glittering, show-stopping opulence of style 6520, which features circular motifs in a decadent halo. 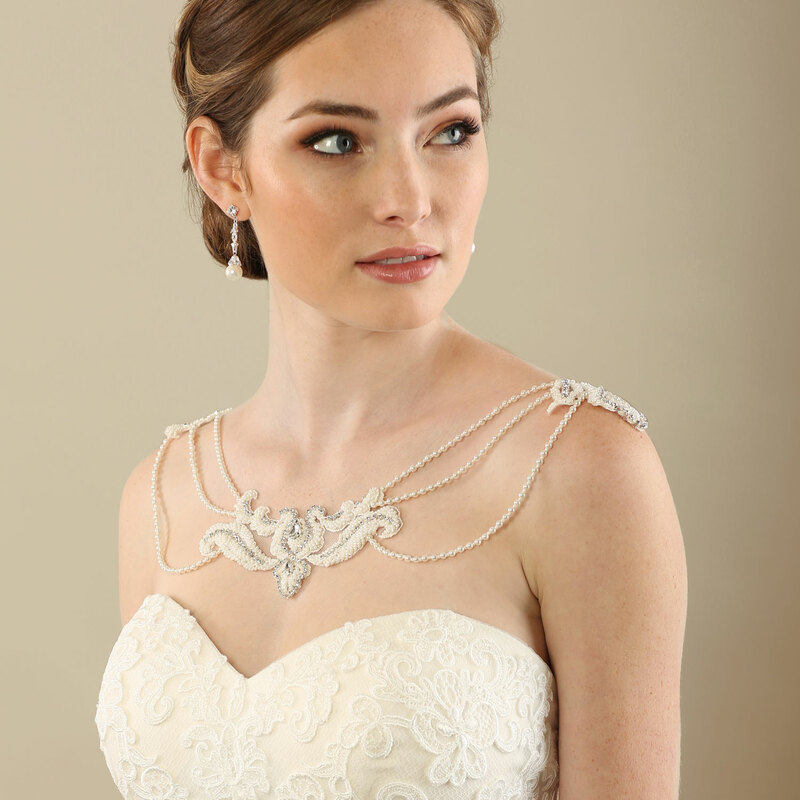 For a free-spirited nod to eras past, consider rhinestone chain headpiece 6502. Feeling flirty? Slip into style 6505 or 6509 and light up the party with your twinkling glow. Which vintage look is your favorite? 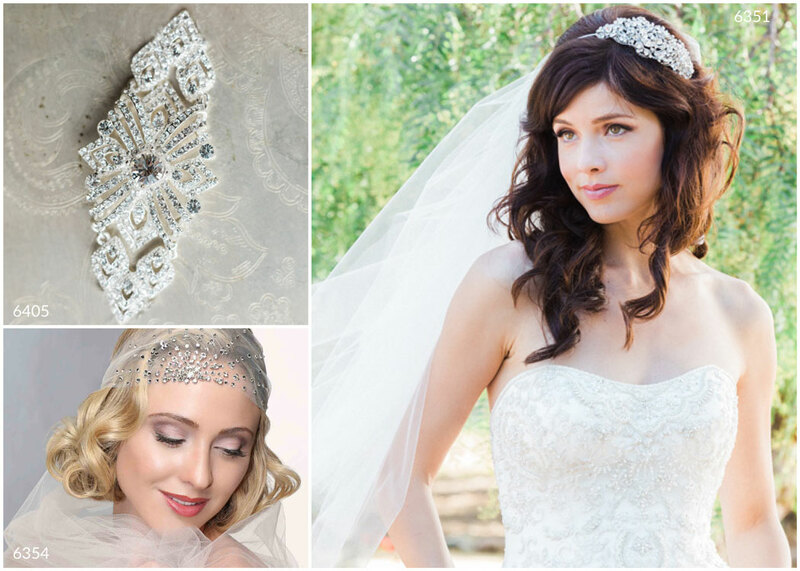 Tell us which styles you’d wear with a bridal veil or extra bling!